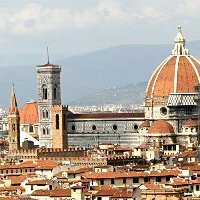 One hour away from our villa there is also the wonderful city of Firenze, the cradle of Italian art and culture, the birthplace of the Renaissance and one of the most visited cities in our country. Considered one of the most beautiful cities in the world for its extraordinary artistic, cultural and landscape, Florence is one of the few cities in the world to be characterized by so many monuments concentrated in a small space such as the Old Town, which among other things is also included in the UNESCO World Heritage Sites List. A real open-air museum, the city of the lily offers citizens and tourists a large number of monuments and places of interest, which are worth a visit. Do not miss the Cathedral of Santa Maria del Fiore, one of the largest churches in Europe, which is topped by Brunelleschi's Dome, the largest masonry dome ever built; the Baptistery of San Giovanni, one of the most ancient and evocative monuments in Florence; the Loggia dei Lanzi, full of wonderful sculptures like the "Perseus" by Benvenuto Cellini and "Hercules and the Centaur Nessus" by Giambologna; the Basilica di Santa Maria Novella, which houses splendid masterpieces created by leading artists such as Giotto, Filippino Lippi and Domenico Ghirlandaio; the Basilica of Santa Croce, known as the "Temple of Italian glories" for the numerous tombs of great artists, writers and scientists; and Palazzo Vecchio, an extraordinary example of civil architecture form the 14th century. PAs for the museums, the most remarkable ones are: the Uffizi Gallery,one of the most famous art galleries in the world, where wonderful works by artists such as Botticelli, Giotto, Titian, Leonardo da Vinci, Michelangelo and Raphael, to name a some, are exposed; the Palatine Gallery,, where you can admire the works of Botticelli, Filippo Lippi, Raphael, Titian, Rubens and Caravaggio; the National Museum of the Bargello, which houses the most important collection of sculptures in the city; and the Galleria dell'Accademia, famous in the world for its collection of statues by Michelangelo, including the famous David. Besides the immense artistic and architectural heritage, Florence has many gardens and environmental treasures such as the Boboli Gardens, a magnificent historic park enriched by an extraordinary collection of sculptures, ranging from Roman antiquity to the twentieth century; the Bardini Garden, which covers a large area from the hill of Piazzale Michelangelo to the Arno; and the Botanical Garden,,now part of the museum of Natural History.